The drill is the centre of any cordless tool kit, whether for weekend warriors or seasoned tradies. It’s the one tool that everyone needs. 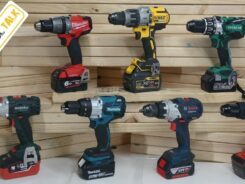 So which cordless drill should you get? We’ve undertaken a comparison of the premium hammer drill from seven of Australia’s leading brands: Makita, Milwaukee, Dewalt, Bosch, Hitachi, Metabo and Hilti. 6Ah batteries were used where possible. The field is made up of the best hammer drill driver from each brand; all are brushless 18V tools except the Hilti, which is a brushed 22V unit. Though premium cordless drills have all but closed the gap to their 240V brothers, the race for the biggest torque figure continues. We chose to focus on ‘soft’ torque, which is closer to the real power that users will feel during regular drilling, rather than laboratory maximums. The testing regime included common and difficult tasks. 150mm bugel batten screws and M10 coach screws were driven into H4 sleepers, such as landscapers often do. 22mm auger bits were drilled through double stacked MGP10 studs, as when roughing-in electrical cables for new homes. The runtime was assessed with 32mm auger bits through triple stacked studs. And finally, 10mm holes into concrete. With the inconsistencies and knots of natural timber some of these tasks can pose a safety risk to the user. For this reason, Bosch, Hilti, Hitachi and Milwaukee have equipped their tools with an ‘anti-rotation’ feature to prevent wrist injury. However, extensive testing found only the Bosch and Hilti to give consistent results and peace of mind. General user comfort was high among the group, with Hilti being the stand-out. This however did not extend to the masonry usage, which was the great divider of the comparison. Masonry testing was dominated by Dewalt and Hitachi, followed closely by Milwaukee then Makita. The Metabo, Hilti and particulary Bosch are to be avoided for those who value masonry performance and comfort. 6 – 10mm anchors are a breeze for the cream of this crop, though the reviewer believes that most trades people would be better served by an SDS rotary hammer drill. Though steel drilling wasn’t scored in this comparison, users will do well with Milwaukee’s One-Key system, which can easily customise the drill’s four modes for different activities. Metabo’s impulse mode is excellent for accurate steel drilling, as well as damaged fasteners. The Bosch and Metabo drills didn’t keep up with the more powerful competition, and Makita was let down only by its runtime. However, these three units are still excellent drills in their own right. Not all users require the best of the best, and some customers would be better served by safer, moderately powered drills. In this comparison, Dewalt and Milwaukee vie for top spot, while Hilti and Hitachi contest third place. Their performances were close, and they were all lovely tools to use. Still, there can be only one winner, and this honour goes to Dewalt. The DCD996 won every test. It is the most powerful in both timber and masonry, and won the runtime test by a considerable margin. There is no power loss with the regular 5Ah batteries. It’s handy middle gear and superb 60 lumen light are nice bonuses. It is an easy recommendation to anyone other than those who want the latest safety features. It is oztooltalk’s 2017 hammer drill champion.